Thistle Modelmakers Model Railway Club are a group of railway modellers in Edinburgh. Members interests range geographically from the UK to USA and Europe. We model in scales including 2mm, 3.5mm, 4mm & 7mm and in guages covering N, HO, OO, EM, P4, O and S7. 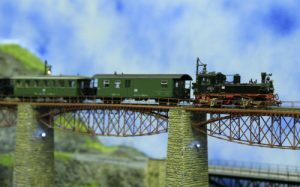 We have interests in Standard Gauge and Narrow Gauge and as a result we have built layouts representing Scotland (OO), America (HO & On30) and Germany (HO & HOe). This website has lots of information on the layouts we have available for exhibitions, a calendar, some links to other websites we have found useful and how to contact us. Thistle Modelmakers was formed from the amalgamation of the Model Railway group within the Edinburgh branch of the SSEB and the Freeman transplant group. The group built layouts to encourage charitable donaions to the Freeman Cancer Hospital in Newcastle upon Tyne. We have had a number of different clubrooms during our existance including an office block in Leith (which was demolished), the switchroom within SSEB Portbello, the top floor of a printers in central Edinburgh and our present home in an industrial unit in Dalkeith. We organised the only major model exhibition in the Edinburgh area for over 15 years using the Meadowbank Stadium, Brunton Hall in Musselburgh and latterly at the Portobello Town Hall. We take our layouts to other exhibitions across the UK and Europe travelling from Falkirk to Frankfurt and Hartlepool to Utrecht. Have a look at our Exhibition calendar to see where we’re going next. 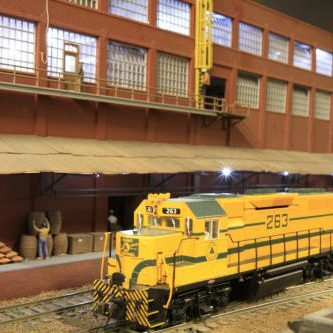 Our exhibition layouts are set in Britain, Europe and the United States they include modern day German HO and HOe, a 1950s British OO model railway layout and 1930s backwoods America and Modern Day Industrial America. 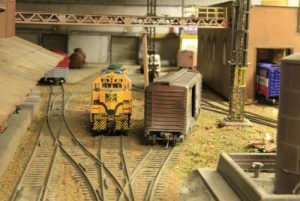 The majority of our layouts are DCC controlled and some have DMX theatrical lighting effects to add interest for spectators. Walker Falls also adds a fully synchronised sound track. If you would like us to exhibit at your show with any of our Club layouts please e-mail the Secretary via the Contacts page. If you are interested in becoming a member of Thistle Modelmakers Model Railway Club or would like to understand what we are working on why not have a look at the information on the Contacts page.